A warm and professional welcome, awaits you at Newport Complementary Health Clinic, from us both, Michael Lloyd and Rebecca Smith. Two successful businesses, with a combined experience of 29 years, working at the highest level and joined together under one name to offer you a truly holistic approach in complementary medicine. Newport Complementary Health Clinic offers Systematic Kinesiology, including dietary and nutritional supplement advice and programmes. Hypnotherapy, Emotional Freedom Technique (EFT) and Neuro-Lingustic Programming (NLP) are used either alone or in combination to encourage long lasting change. Life Coaching sessions address the most important aspects of your life, allowing you to identify the obstacles and take action to remove them. Osteomyology Remedial Massage and Spinal Touch are used to address musculo-skeletal pain and dysfunction. These titles encompass a wide variety of techniques allowing us the flexibility to tailor every session to suit your individual needs. The clinic came to its existing location in Barclays Bank Chambers, in 2002, when suitable premises were found to join our two existing businesses under one roof. Deceiving to the eye at first glance, the building is full of age and character, with many clients commenting on its comfortable, relaxed atmosphere when they enter. The clinic provides a calm, theraputic environment, allowing you to feel confident and re-assured at all times, that we genuinely have your best interests at heart. As complementary health practitioners we pride ourselves on taking the time to listen to your needs and offer the treatment and support that is best suited to you. All aspects of our work remain private and confidential, always working within your comfort zone. We look forward to welcoming you to the clinic and invite you to share in the experience and enjoy the benefits. In the meantime, we offer our help and information in any way that we can.
" Our business vision at Newport Complementary Health Clinic is to offer you a service that no one else offers. Our reputation has been built on providing nothing short of what we would expect ourselves." 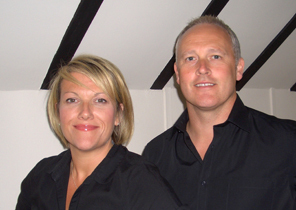 "I would highly recommend Rebecca and Michael as professional and highly qualified practitioners." "While being fully absorbed in their professional capabilities, both Rebecca and Michael impart their assurance in a friendly atmosphere. I would not hesitate to recommend either of them."